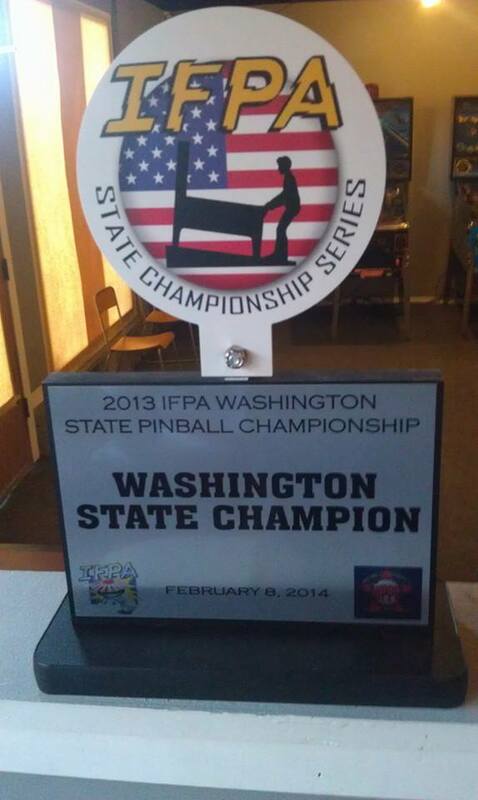 The IFPA State Championship Series is an annual pinball competition with players qualifying throughout the entire calendar year. 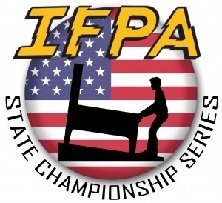 At the end the calendar year, the top 24 players with the most WPPR points from each state will qualify for the IFPA State Championship Playoffs, where they will play for the title of IFPA State Champion within that state. Click Here for current WA State standings. To be eligible, a player MUST have completed their IFPA profile with current contact information, including email and current location. To verify, go to your IFPA player page, look under "Player Information" on left, and ensure your location is listed and it says "Registered". If it doesn't, please visit http://www.ifpapinball.com/menu/user-profile to update profile. Announcements at 11:00am, with play expected to begin by 11:15am. Players can warm-up and practice between 10:00am and 11:00am on any available machines. The State Match Play Tournament is expected to begin at 3:00pm, after the quarter finals (Round of 8) begins. Thus players who do not make the final 8 will be able to play in that tournament without conflict. While exact length of tournament cannot be guaranteed, it is estimated that the Finals (final two players) will commence around 7pm, and be done by 9pm. The state championship brings together the 24 top-ranked players from the state who are able to make it to the event. They will be seeded in a 24-player single-elimination bracket of head-to-head competition, with 8 highest-seeded players earning a first-round bye. Each match is best 4-out-of-7. The higher seeded player will have choice of machine or position for the 1st game, with the loser of each subsequent game having choice of machine or order, until someone has won 4 games. All participants should read through the IFPA SCS Official Rules prior to the event. The prize pool grows based on number of players in IFPA sanctioned events in the state of washington. Current prize pool is over $4000, with winner earning over $1000. For the precise tally of the Washington State prize pool, go to the IFPA Washington State Statistics webpage. The winner also gets an entry into the 2018-2019 IFPA North American Pinball Championships in Las Vegas, NV on Thursday March 28, 2019. If the winner cannot make it, then second place finisher has option of going. Second, Third, and Fourth Place winners each receive a plaque, graciously provided by the host, 8-Bit Arcade. Note: These rulings are general for all Super Week events. Some rules might not be in effect in some events as noted or if not applicable. Anytime an abnormal circumstance occurs, a tournament official should be notified. To ensure consistency throughout the tournament, PLAYERS SHOULD NOT RESOLVE ISSUES ON THEIR OWN. Except for customized rules explicitly covered on this website, PAPA/IFPA Tournament Rules will be used to address malfunctions and as the basis for rulings. Note also that any rule posted at the event, such as on the backglass of a machine, will override any rule described herein. The rules listed here are generalized for all Super Week events, and might not apply to some specific formats. Runaway Score Rule: (Will be in effect in all Super Week events except the State Championships). Pinball is not a timed game, and occasionally a player has a dominating game that could take a half hour to an hour or more. While these can be impressive games to watch, they wreak havoc on a tournament schedule. This Runaway Score rule is to address such long games to ensure sufficient time to play every game within constraints imposed by the schedule. If a player has an extremely strong game in which it is highly unlikely that any opponent catches them, the tournament official may invoke this rule and ask the player to end their ball and game, in favor of saving time. The tournament official may consider factors such as reachability of the score by opponents, prior demonstrated strength of opponents, whether the round is ahead or behind schedule, or other factors that can affect successfully running a full round. Should this occur in a match play, the player automatically receives 7 points for the win (or 3 points in multi-play scoring), regardless of the ensuing performance of any other player. During the course of the game, if any other player catches this runaway score, that player will also receive 7 points (or 3 points in multi-play scoring), and be asked to end their ball and game. Points earned by other players who do not exceed this runaway score will be per the position they finish in. If only one player reaches runaway score, then bonus points will be computed normally, except that the player with a runaway score will always win the bonus point. If more than one player reaches a runaway score, then players who finished 3rd or 4th will not receive any bonus points in that game. If this occurs in a knockout tournament, anyone who catches the player who stopped play with a runaway score will get no strikes. Delay of Game: Due to the tight show schedule, delays due to players not being ready to play are problematic. When a new game is announced, players are expected to immediately proceed to their assigned machine. If a player has not shown up within one minute, please notify a tournament official, who will start a 2-minute timer. Players who have not arrived within 3 minutes of the start of a round may be given an official warning and have their balls plunged by a tournament official. Between balls, players are generally allowed 1 minute to get to the machine and start their ball. Exceptions could be granted (e.g. player needed restroom; tournament official is involved in game and needed to make a ruling, technician at neighboring machine needs space, etc. ), but these are generally expected to be occasional and the player would have informed the other competitors ahead of time of the need. No additional time is provided if previous player tilts, due to use of fast-settling tilt bob. If a player regular does this, opponents should notify a tournament official. Upon first observation from a tournament official, a warning and ensuring player is familiar with this rule. Repeated offences within a round may lead to disqualification from the game or round. A tournament official may plunge the ball of a player on first offense if they take more than 2 minutes and haven't informed opponents of the need for extra time. A player who is a no-show for an entire game forfeit's their opportunity to continue playing in the tournament. Machine Setup Changes: Tournament officials reserve the right to modify any machine between games or between rounds, including changing of settings, tilt sensitivity, machine level, or any other adjustment that is deemed desirable to make the tournament run more smoothly and be more fair and fun. 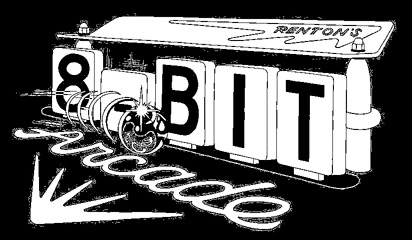 Since a player is only competing against the other players in the same game, all players will encounter such changes at the same time, and it is part of pinball to be able to quickly adjust to changing conditions of a machine. Tournament officials also have the option to remove any machine from play even if machine playing well, due to long average ball times. Machines chosen at random each round may be chosen from a subset of machines available, with playability and average ball times of each machine taken into consideration to form that subset. Extra Balls: Extra balls will be disabled whenever possible. If an extra ball is not disabled and earned, then refer to a note on the backglass on whether to play or plunge it. If no note, check with Tournament Director first. If an extra ball is to be plunged, then player may touch flipper buttons to setup skill shot, then plunge ball in attempt to get the skill shot. The player may also choose to tilt the machine prior to plunging in lieu of skill shot and end-of-ball bonus, but a tilt anytime after a first plunge attempt will result in disqualification. Once ball is in motion the player must step back and cannot touch the machine, unless the ball returns back to plunger lane and is not auto-plunged, at which time they can re-attempt a skill shot. In the case that a player has a compensation ball awarded due to a major malfunction, and they earn an extra ball, they may choose to play the extra ball in lieu of the compensation ball in a new game. Bonus Balls: A bonus ball is differentiated from an Extra Ball in that it is timed, and ends when the timer runs out. Space Shuttle and Medusa are examples of two machines with Bonus Balls. Bonus balls CAN be played. Fast-Settling Tilt Bobs: Machines will be equipped with Fast-Settling Tilt Bobs when possible, using the ear-plug tilt hack, so that even sensitive machines tend to give only one danger warning after a strong nudge or save. With this mechanism, the tilt bob usually settles to a full stop within 15 to 20 seconds, and thus no need to wait longer between players when the prior player ended their ball by tilting. As a result, the delay-of-game rules don't allow for extended waits after a player tilts, as described next. This does not apply to satellite tournaments that are held on location, with most machines as-is. Waiting for Machines: The state championship format will take many hours, to the point where if there are significant backups with everyone waiting to play the same machine, we'll never finish in time. On the other hand, we want every player to still have as much choice as possible, especially to play their favorite machines. IFPA rules now state that players can wait however deep necessary to play the machines they want. Thus depth of waiting can only be managed by the players themselves. We encourage each player to be considerate and select the machines we want, but in the order that takes advantage of the shortest wait times for machines. At the start of each round, if multiple players want to select the same machine, the player with the highest seed will go first. If a machine is currently broken and actively being repaired, and estimate to repair is 5 minutes or more, players cannot wait for the machine. If the machine becomes available at a later time, then the player can select it in a subsequent game. Final Tournament Standings: Final finishing position for players who lose in round 1 will be between 9th and 16th, with players ranked based on number of wins that round. Final finishing position for players who lose in a later round will first be determined by number of wins in the round they got knocked out. Players tied will have the tie broken based on number of wins in each previous round until tie is broken. If same number of wins each round, then those those players will have their final tournament position listed as a tie. For questions and inquiries regarding this tournament, please contact wapinball@gmail.com.